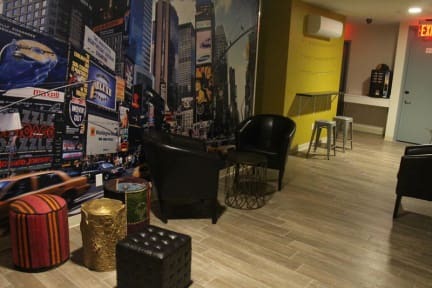 I love stay in this hostel every time I’m in NYC! It’s safe and the best location ever! the free water fill was a great idea and eco friendly. Excellent location, and tremendous value for money spent. You are a couple of blocks away from Central Park, minutes away from many museums and a 20 min walk from Madison Square Garden. My room was quite noisy because it was next to the street and sometimes the buses make too much noise, but nothing too bad. The WiFi was my biggest issue since it was always terrible and the staff at the desk are not very polite. The place is great for being right in the middle of Broadway and Times Square. There isn't much to it, but it was comfortable and had what I needed for a one night stay. One thing to note was that both my bed sheet and my towel had a stain each, but they smelled clean, so I didn't really pay much attention to it. There is no atmosphere per se, but if you need a quiet place to stay at, this is the one! The location is really near to the Columbus Circle, so it was really good to go somewhere by subway. Employees are just what they have to do and don't do more than that(Not kind, smiling service) The thing is because there is a restroom and shower room in a room, so I don't need to share them with a lot of people. It was good that I can regulate the room temperature by myself in the room. Not bad, stayed well. It’s in a good area (you can find almost everything close by) and it is super clean. The people who work at the reception don’t seem to be interested a lot in “having an hostel” and the spirit of the hostel. They don’t have events (like tours) or any other initiatives or activities. They seem more interest to make money. This was the feeling that I had when I arrived there. It’s expensive compared to many different hostel. Very poor breakfast, no facilities. I stayed one night and I couldn’t sleep in the whole night because a group of people stayed at until 5am making noise and playing music in the hallway. They supposedly have a policy that forbids making loud noise from 11pm to 8am but obviously nobody controls it. This place is not worth the price!!! The staff are not very friendly and the breakfast is a joke. 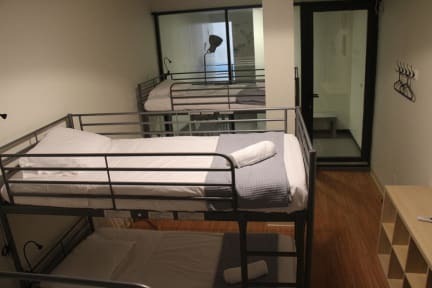 I wouldn’t come again to this hostel. It was nicely positioned in NYC between major landmarks. However in comparison to other hostels the staff did not seem to take much pride in their location. The cleaning ladies were working hard, so they place seemed clean. But the desk staff did not seem interested in helping much.